Daniel Penado Zavala was 17 when he made a heart-wrenching decision to leave his family behind in San Salvador and try to make a new life where it was safer. He saw gang members target and kill young people like him. After his stepfather was slain, Daniel's mother was left to support him and his three siblings. He, too, would be a victim if he resisted the wishes of thugs, he thought. That's how life had become for people without means in El Salvador. Gang members infiltrated public schools, he said, and threatened kids to join their ranks. He scraped together $7,000 -- a huge sum of money for a family like his -- to pay a coyote, or smuggler, to arrange a harrowing journey, first to Mexico and then over the Texas border. 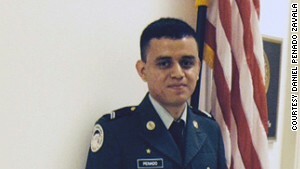 Daniel Penado Zavala fled violence in his native El Salvador and hopes to make a better life in America. Daniel's is not an unfamiliar story anymore. Thousands cross the southern U.S. border illegally each year in hopes of better lives. But now the problem has reached epic proportions, with children like Daniel fleeing the Central American countries of El Salvador, Honduras and Guatemala. And they are arriving in the United States alone -- without a parent or guardian. Many are hoping to be reunited with parents or relatives already living in America, and they cross the border without papers because there are virtually no legal ways for them to immigrate. Nor can their undocumented parents return home to get them. The number of children making these journeys by themselves has doubled each year since 2010. 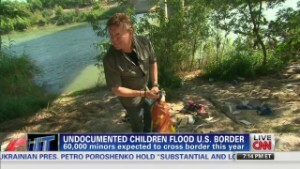 U.S. authorities estimate that between 60,000 and 80,000 children will seek safe haven this year. Immigrant rights agencies project that number could soar to 130,000 next year. That's more than all the people who came over from Cuba during the Mariel boatlift in 1980, which would make this the largest refugee crisis on U.S. soil since then. Some of the children are as young as 4. They have notes pinned to their shirts giving authorities a name and phone number or address of a relative in the United States. Suddenly, U.S. Border Patrol agents are finding themselves having to care for thousands of young lives while enforcing the law. To complicate matters, immigrant advocates say the crisis has proven to be fertile ground for human traffickers who are quick to take advantage of the chaos. Texas Attorney General Greg Abbott cited a 92% increase in the number of immigrants 18 and younger who are being arrested at the border with Mexico. In a letter to the Department of Homeland Security, Abbott asked for $30 million to help secure the border. "With the Border Patrol's focus shifted to this crisis," Abbott said, "we have grave concerns that dangerous cartel activity, including narcotics smuggling and human trafficking, will go unchecked." Everyone involved has gone into emergency mode, said Wendy Young, president of Kids in Need of Defense (KIND), a national non-profit immigrant child advocacy group. "Right now," she said, "we are in triage." Immigration reform has stalled in Washington, but the shocking new reality has brought the issue back to the forefront. It has overwhelmed U.S. facilities along the border and forced federal authorities to scramble to find viable solutions. They've had to open temporary shelters because the existing ones are filled to capacity. Journalists are not allowed inside, but leaked photographs of a Border Patrol holding facility in Nogales, Arizona, show cramped cells without enough food, beds, toilets or showers. They seem more befitting of refugee camps Americans hear of in war-ravaged regions of the developing world than right here at home. From those less-than-ideal conditions have risen allegations of sexual abuse, threats of violence, strip searches and filthy conditions. A complaint filed Wednesday by the American Civil Liberties Union and four immigrant rights groups lists accusations made by 116 children. Half described a lack of medical care. Others describe ice-cold holding cells in which bright fluorescent lights were kept switched on day and night. About 70 percent of these children said they were held by the Border Patrol longer than the statutory limit of 72 hours. President Barack Obama has announced an interagency Unified Coordination Group to respond to humanitarian needs. Recently, Homeland Security Secretary Jeh Johnson said the Coast Guard and military are being deployed to transport and help house unaccompanied minors. He also said he is discussing faster repatriation with the ambassadors of the three Central American countries of origin. Immigrant advocates say federal authorities should not have been surprised by a trend that advocates on the border have seen coming for years. When you have a confluence of violence and poverty, they say, people flee. "We've had children dying here in the desert," said Isabel Garcia, an immigrant rights activist with the Arizona-based Coalicion de Derechos Humanos (Coalition for Human Rights). "It really is unacceptable, the entire thing." 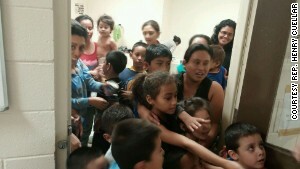 The office of Texas Congressman Henry Cuellar released this photo showing crowding at a Customs and Border Protection detention facility in South Texas. 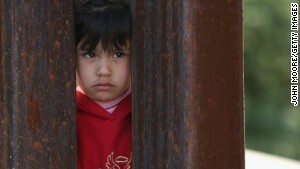 A child on the Mexican side of the U.S.-Mexico border fence looks into Arizona during a special 'Mass on the Border' on April 1, 2014 in Nogales, Arizona. On a recent morning on Capitol Hill, Daniel told a small panel of lawmakers the tale of his perilous journey to the U.S. border. How he waded through a river infested with alligators, drank its murky waters, slept in a locked room with 20 people. After the coyote abandoned him, he crossed the U.S. border and walked the desert alone without water or food. He lay down on the parched ground and abandoned hope. "I started crying and thinking this was the end," he said, recounting his journey for CNN. He hoped that the Border Patrol would find him. He prayed to God that someone would find his body to take back to his family. He found the strength to go on only when he thought of Magaly, the 13-year-old sister he left behind in San Salvador. He loved her deeply and wanted so much to be able to send money home to pay for a good education -- one that would help her stay safe. There's little doubt that poverty and violence are two big reasons for the rising tide of Central American children fleeing their homes. A United Nations report published in March found that most children feared for their safety in their home countries. U.N. refugee agency staff interviewed more than 400 children in U.S. custody and listened to stories similar to Daniel's. A 17-year-old boy who fled Honduras said, "My grandmother is the one who told me to leave. She said: 'If you don't join, the gang will shoot you. If you do, the rival gang will shoot you, or the cops. But if you leave, no one will shoot you.'" A 14-year-old girl from El Salvador said: "The biggest problem is the gangs. They go into the school and take girls out and kill them. ... I used to see reports on the TV every day about girls being buried in their uniforms with their backpacks and notebooks. I had to go very far to go to school, and I had to walk by myself. There was nowhere else I could go where it would be safer." The report found a strong link between regional violence and insecurity and new displacement patterns -- children migrating northward. "This new trend is heartbreaking," said Nicole Boehner, who works as a protection associate for the United Nations High Commissioner for Refugees in the United States and oversaw the research for the March report. She said the first priority right now should be the protection and safety of the children, who have lived through trauma. "These are incredibly courageous children who have made a decision that no child should have to make," Boehner said. "Think about how hard it is to make a decision to leave home and travel somewhere completely foreign because of the need for safety. "They showed incredible courage," she said. "They deserve to be protected. And they deserve to have a childhood." Beyond the short-term need to ensure safe environments for the children, Boehner said ultimately, the waves of child migration will have to be addressed as a foreign policy issue. "This is a regional problem and requires a regional response," she said. But not everyone agrees with the U.N. assessment. Many blame the Obama administration for fostering a misconception that if you are a child who ends up in America illegally, you will get a free pass to stay. Republican Rep. Bob Goodlatte of Virginia called the surge in children an "administration-made disaster." "Word has gotten out around the world about President Obama's lax immigration enforcement policies, and it has encouraged more individuals to come to the United States illegally, many of whom are children from Central America," said Goodlatte, chairman of the House Judiciary Committee. Obama's critics blame policies such as Deferred Action for Childhood Arrivals (DACA), which offers relief for certain undocumented immigrants who arrived in the United States as children. Johnson, the Homeland Security secretary, suggested that Central American families believe that their undocumented children may be spared from U.S. deportation under DACA, even though those arriving now do not meet the eligibility criteria. Immigrant families also may be assuming their undocumented children would someday be eligible for a proposed pathway to citizenship, Johnson said. But current immigration reform proposals don't make such offers. "Those apprehended at our border are priorities for removal," Johnson said. "They are priorities for enforcement of our immigration laws regardless of age." Despite the reality, many Central Americans are holding onto hope. Sgt. Dan Broyles, a deputy constable in Hidalgo County, Texas, said he has been helping Border Patrol agents for decades and has never seen anything like the current crisis. "We're not having to chase them down anymore," he said. "They come over here and they want to get caught. They make no quarrels about getting caught." After two days in the Texas desert, Daniel came across a house. The owners fed him and called the Border Patrol. He was given a health screening and underwent a routine process of fingerprinting and identification. Then he was sent to a shelter, like all the others who are coming across now. The laws are different for citizens of contiguous countries who cross the border. Unaccompanied children from Mexico and Canada are repatriated unless they are determined to be victims of trafficking. But with non-contiguous countries, children are taken into U.S. custody. Federal law says minors cannot be held at a Border Patrol facility for more than 72 hours. They have to be processed and then either sent to live with a relative in the United States or released to a shelter operated by the Office of Refugee Resettlement, which falls under the Department of Health and Human Services. The refugee office operates about 100 permanent shelters for unaccompanied minors, said spokesman Kenneth Wolfe. Right now, they are filled to capacity. The surge in children crossing the border has forced authorities to open three temporary shelters at military bases -- Lackland Air Force Base in Texas, Fort Sill in Oklahoma and Naval Base Ventura County in California. In Daniel's case, authorities contacted his aunt in Alexandria, Virginia, and he was sent to live with her until his immigration status is resolved. That's how it works for many of the children entering America now. If authorities can find a relative, the children are put on buses that take them to cities and towns across the nation. But often that's when another set of problems begin. Beyond the life-and-death journey, beyond the crisis that's making headlines lies another journey, one that can be equally perilous for a child in a different sort of way. The law mandates that a child must at some point appear before an immigration judge, who could decide to grant special immigrant juvenile status if that child has been abused, abandoned or neglected and is unable to be reunited with a parent. That status gets children permanent residency in the United States -- also known as a green card -- although they are barred from petitioning for a green card for their parents and cannot petition for a green card for their siblings until becoming U.S. citizens. Or children may file a petition for asylum if they fear persecution based on race, religion, nationality, membership in a social group or political opinion. Either way, without a lawyer, it's hard for children to argue their case. And in many cases, they're not able to, said Stacie Blake, director of government and community relations for the non-profit U.S. Committee on Refugees and Immigrants. "That's the trick," she said. "Everyone has an immigration hearing scheduled but everyone has to find an attorney. There's no system in place for children." In Daniel's case, for instance, his family could not afford a lawyer and he missed his chance to petition for special juvenile status. He is now 19, an adult, and no longer qualifies for that. Immigrant advocates say they have seen young children appear on their own in court, not knowing how to make a case for themselves. It's a situation that's made even more difficult by the fact that few are able to obtain proof of what happened to them in their homelands. Often, there are no police reports or other documents, so judges have to rely on the veracity of their stories. Immigrant rights groups say they are scrambling to recruit more lawyers who are willing to represent undocumented children for free. Young, the president of KIND, said her group has trained 7,000 such lawyers since 2009. "But the problem is you can't just hand a volunteer attorney who is a corporate lawyer and say, 'Have at it,'" she said. "You need to train that lawyer in immigration law." And there isn't always the money to do that, she said. The bottom line is there aren't enough lawyers to go around. "Imagine a kid who is 5 who does not have representation," Young said. "That child is likely to be deported." Add to that equation an already burdened immigration court system, and many children find themselves in legal limbo for years. Michelle Abarca, a lawyer with Americans for Immigrant Justice in Miami, said on some days she has as many as 30 cases on the court docket. "I equate it to working in the ER," she said. 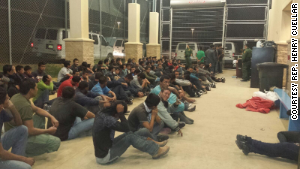 Another photo released by Rep. Cuellar's office shows immigrants housed at a crowded Customs and Border Protection detention facility a in South Texas. Right now, we are in triage. Daniel is a junior in high school now. He learned English as a second language and does fairly well with grades. His lowest has been a C, he said. After school, he works as a mechanic and dreams of becoming an engineer in the Air Force. He joined the ROTC program at his high school and proudly wore his uniform when he appeared on the Hill. He broke down in tears as he described for lawmakers how he made it to America. "It was a terrible idea to come over like that. I don't want anybody to come like that," he told CNN. "I wanted to testify. I want people to know what happened to me. I don't want anybody else to experience that." He sends money home for his sister's education at a private school, where she is safer and further out of the reach of violent gangs. He promised his two younger brothers that if he has the opportunity to go to college and get a better job, he would help them, too. He is part of a fast-growing population of young Central Americans who find themselves in a land of opportunity but without documentation. Immigration reform could help alleviate the current crisis, depending on the legislation. Immigrant rights activists say that legalizing the undocumented, even if they're not given a pathway to citizenship, would let Central Americans travel back to their homelands to visit the children they left behind. That could help reduce the number of children crossing over the southern U.S. border. "I hope the government decides to protect people and we can have the opportunity to live here," Daniel said. "It's very hard without anything that recognizes us." He regrets that he could not afford a lawyer when he still qualified for special juvenile status. Now with the help of the U.S. Committee for Refugees and Immigrants, he has petitioned the United States for asylum. But Daniel and his advocates know there's a chance he will be deported to San Salvador. It's a thought that haunts him every day.